If you’ve chosen to age in place, a keyless entry system is a great way to prevent falls, difficulty in opening doors, and accidents. As people age, they often have to deal with less mobility of their hands and wrists due to arthritis and less motor control. This could greatly affect your ability to turn a key and a door knob, and shouldn’t be overlooked. With a keyless entry system, the process of getting inside a door is changed to using things like keypads or even your fingerprint, so it doesn’t take much mobility or effort to use. Furthermore, we all know how difficult it can be to dig for your keys if they’ve fallen to the bottom of a bag or your pocket. Struggling this way could lead to falls, which cause about one-third of injuries in the United States. Safety aside, keyless entryways also make it so that you needn’t worry about remembering where you put your keys – a great solution for forgetful seniors. Take a look at some of the best keyless entry options below, and take a step toward making life easier as you age in place. It is a versatile product that is user-friendly. 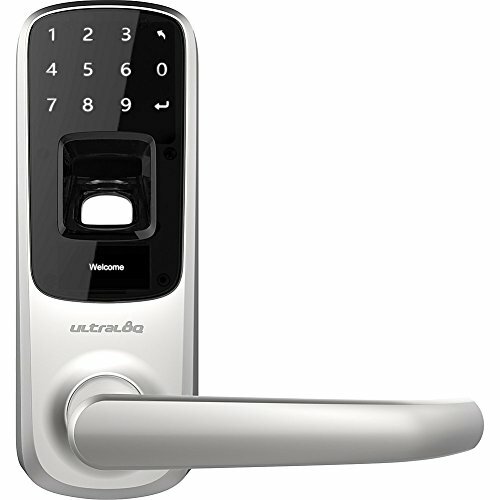 The Ultraloq UL3 BT Bluetooth Enabled Fingerprint and Touchscreen Keyless Smart Lock is an excellent example of innovative technology that can work to help seniors age in place. This lock is versatile with five options for opening doors, including fingerprint or code. You can even still use it with a key if you prefer, which is a great option for caregivers who need a surefire way to get into the house should there be an emergency. The keypad on this lock is touchscreen, which is the easiest way for seniors with limited mobility to be able to use a lock code. Once your code is programmed, you don’t need to worry about pushing any buttons or struggling with buttons that might get stuck. The touch screen is sensitive enough that you don’t need to push it too hard. Beyond that, the lock also comes with fingerprint identification, which is even easier to use than the keypad. All you would need to do is hold your finger in place until the technology recognizes it, unlocking the door for you and securely only letting you in with your unique fingerprint. It’s additional features include an impressive battery life and several security upgrades, such as an anti-peep keypad. You can take total control of who enters your home to keep you safe. You can also view a log of both unsuccessful and successful entries, if you’re worried that someone might have tried to open the door where it’s installed. We feel the security features on this lock are a great benefit for caregivers who might not be able to check on seniors constantly, but would still like to know they’re safe at home. It has several security options that make it an excellent buy. You can open the door with either a passcode or Radio Frequency Identification (RFID) tag. 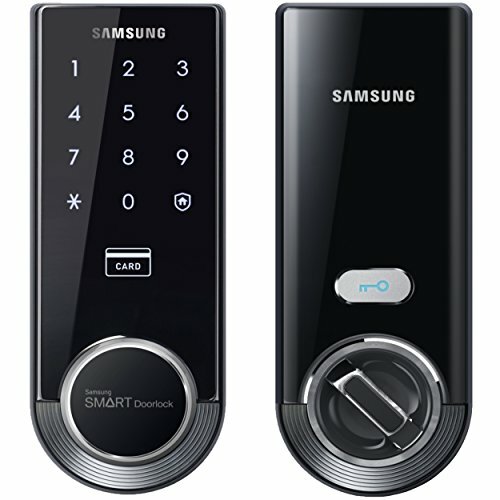 The Samsung SHS-3321 Digital Door Lock is a user-friendly product with extra options that improve its security. It will work with most standard-sized entries with a universal deadbolt. Since this lock does not come with a keyhole, it’s pick-proof and completely secure against fake or “bump” keys. It’s auto and double locking for extra security, so there’s virtually no way a burglar or intruder could get through. The lock will also disable itself if someone tries to force the door open or has multiple unsuccessful attempts to enter the right code. While this is a great feature for security, this means it might not be the best option for seniors who might forget their code easily and accidentally lock themselves out. The lock also has an “Away Mode,” so that you can activate it if you plan on being out for a while. This feature will sound an alarm if the lock is tampered with from the inside, meaning an intruder who may have gotten in from another entry point will not be able to leave using this lock without sounding the alarm. 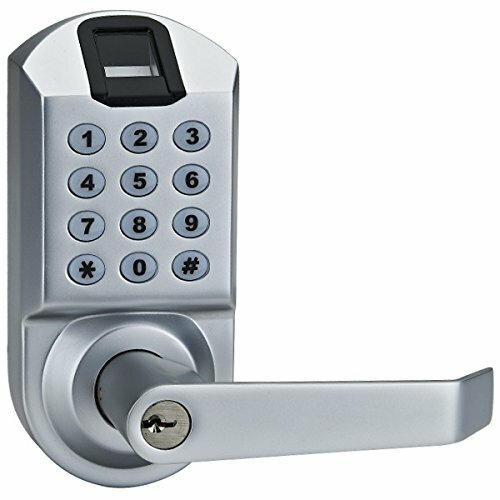 For seniors, this lock also has some specific features that are great for aging in place. Since it is a touch screen keypad, it doesn’t require much effort to key in your code for entry. Furthermore, the handle on this lock allows you to push and pull rather than turn a knob. This is something very important to consider if you’re a senior suffering from arthritis or limited mobility in your wrists. The lock also has a fire warning feature where it will sound an alarm if it senses smoke or heat. While your home should already have a smoke or fire alarm, the extra alert coming from this lock is an added bonus for seniors who might be hard of hearing and need to make sure they’re alerted in an emergency. It is a value-priced lock with many of the features of more expensive products. 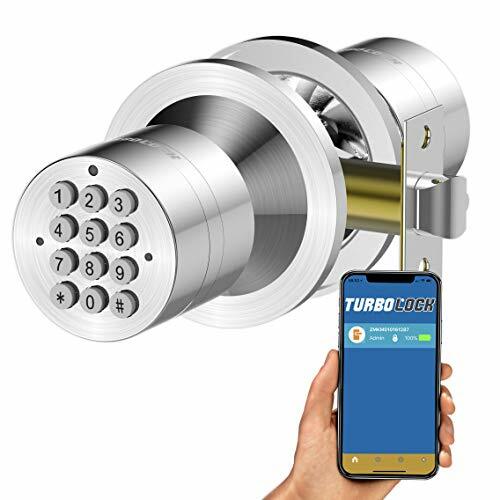 The TurboLock TL-99 Bluetooth Smart Lock offers an economical keyless entry product that can still give you the peace of mind you deserve at a more affordable price. It is one unit with the keypad on the knob itself. You can set any amount of passcodes you want including single-use or time-sensitive ones. It’s an excellent option if you have a caregiver or nurse who visits you frequently. And if the grandkids or family come to visit, you can also switch it to “Passive Mode” to bypass the code entry. Installation of the lock is easier than comparable products, which also adds to its value for seniors who are aging in place. It works with a corresponding smartphone app to allow for real-time monitoring and added security. You may find it quicker to enter your passcode with its intuitive design. For seniors who have had trouble with using touch screen due to aging hands and fingers, we feel this is the best option for a keypad with buttons. They’re easy to push and shouldn’t cause any trouble or additional effort when getting inside your door. It is an interior-only product with enhanced security features. The SCYAN X7SC Keyless Keypad Door Lock combines some of the best features that we’ve seen in the previous models, while pairing its features down to be simple to use for everyone. It comes with three different options for entry – key lock, keypad, and fingerprint recognition, so you can use the option that best works for you while also providing other methods of entry for caregivers or loved ones who might visit your home often. While other keyless locks are Bluetooth enabled and might require setup via Wi-Fi, this lock is all manual. Depending on your use of technology, this could be either a pro or a con. For seniors, this lock makes it easy to enter your doorway without having to struggle, as it comes with a lever door handle instead of a knob. It has a backup with the addition of a 9V battery. You can also disable the lock temporarily if you’re using the entrance frequently or know you have visitors coming. Unlike other products we reviewed, this one is for indoor use only and is not waterproof. It also has a key override which is something we liked for situations where a senior may have forgotten their key code or a caregiver needs a way to get into the doorway easily. The design is also user-friendly with a backlight to make entry less of a hassle, especially for seniors with limited eyesight. It is an affordable option with many of the same features in more costly items. 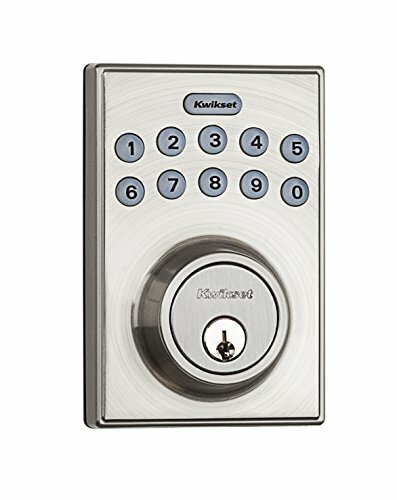 The Kwikset 92640-001 Contemporary Electronic Keypad Single Cylinder Deadbolt is a budget-priced device that gives you the security you want at an affordable cost. It has an attractive satin finish with user-friendly features. For seniors with limited eyesight, the keypad is backlit so you can locate the correct buttons for your unique code even if it’s dark where you are. Furthermore, the keypad is easy to install, which adds to its value for seniors since you don’t need to purchase anything else for installation and might even be able to handle the process yourself if you live alone. This lock is one of the simplest we’ve reviewed, so it’s also great if you’d just like some added security for your home and don’t need too many added features. The keypad buttons are easy to push, but there’s also the option to use a key if you’d like to. The deadbolt is safe and secure, and you can also customize the door to automatically lock for peace of mind. It works as described, but the programming is a bit more challenging for those who are not tech-savvy. It’s also not as watertight as we’d like, making it an option for sheltered entryways instead of those exposed to the elements. Its value lies in the ability to customize it to your needs. 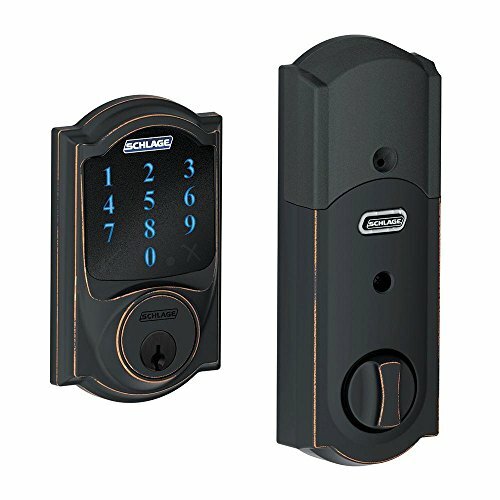 The Schlage Z-Wave Connect Century Touchscreen Deadbolt with Built-In Alarm is versatile on several fronts. Security-wise, It alerts users audibly to any activity, forced entry, and tampering with the lock. It is also Z-Wave compatible so that you can use it with an existing security system that uses the same technology. It comes with a motorized bolt, touch-screen keypad, and keyhole if you’d still like the option to use a physical key. The device can be programmed with multiple codes so you can control entry to your home, which is a great feature for those with visiting family, nurses, and caregivers. For seniors with limited eyesight, the display is easy to read with bright, backlit numbers in a simple, large font. It’s also fairly easy to install, so it could be manageable for seniors who live alone. The remote capabilities of this lock allow it to be paired with any Amazon Alexa device. With this feature, seniors would be able to open the door even if they’re in another room or can’t make it to the door. This could be a great safety feature, especially if you have limited mobility or are recovering inside your home from a surgery or injury. Now that you’ve seen how helpful and versatile these locks are let’s move on to discuss the features in detail to help you make an informed choice. Things to consider include your entry options, backup, security upgrades, and ease of use. The point of using keyless locks is to give you the convenience of opening your door, hands-free. That may mean entering a passcode or using your fingerprint in place of a physical key. Some may use RFID technology to make it even easier. That will involve just putting a tag or key fob close enough to the device to trigger the locking mechanism. Others may offer different options such as voice recognition or smartphone integration. You’ll likely see products with accompanying apps that allow you to control it remotely or view logs of its usage. When evaluating the different entry options, consider how much mobility you or your loved one have. Pushing buttons is easier than turning a key, but using a finger print sensor could be even easier, as long as the senior has experience using their fingers for touch screen. Furthermore, different living situations could call for different features. If you or your loved one needs frequent visits from caregivers or nurses, it could be best to choose an option that still has a physical key for emergencies. Certain locks also come with multiple programmable codes, so you could give each visitor a unique code for added security. Remote options may also be a great choice for seniors who are comfortable using the technology and may have limited mobility to be able to get the door all the time. One of the best benefits of a keyless entry is the enhanced security that they provide. You’ll find it in many different forms. It may mean double authentication where you have to use two ways to enter your home. Usually, that means a combination of a passcode and RFID. That adds an extra layer of protection to keep you safe. If you live alone, that’s a dealmaker. You may see other features such as built-in options to prevent abuse and pranks. You’ll also find ways to create multiple user codes. This is an outstanding way to have more control over who can enter your home. You can set permanent ones for a caregiver or child that may need access; you may also be able to have temporary ones for repairmen to visit or to have something installed. One concern that many have with these devices is the inability to unlock it if there is a power failure. Most manufacturers recognize it and include backup options to ensure that it will still function as normal. It may involve a battery plugged into the unit or an early warning alert to prompt you to swap out batteries before it stops working. We strongly urge you to stick with products that offer this feature and take whatever steps you need to do to make sure that it works. Don’t leave it to chance. You’ll need to be comfortable with technology if you’re opting for a smart device. The manufacturers strive to make the operation of these products intuitive, but you still might need to be familiar with their usage for it to make sense. Some keyless entry models offer expert installation—at a price. If you have a son or daughter who is tech-savvy, it’s an excellent time to ask them for some help with it. You’ll likely find more uses for the system the longer that you use it. Bear in mind that if you have one that is Wifi or Bluetooth-enabled, the manufacturer will probably continue to update it. It’s essential to keep up with the latest version to get the most out of its functionality. Other factors to consider with usability include the keypad, lighting and door handles. If you’d like to use a keypad outdoors, make sure it has sufficient backlighting so you can see the keys in the dark. Furthermore, may options come with attached door handles that vary in type of use. For those with limited mobility, a push and pull level would be the best option. Keyless entry products offer an excellent way to take charge of the security and feasibility of entering your home. They are often affordable and customizable to fit your unique needs. Even if you’re not tech-savvy, you can always find one that is easy to install with plenty of options for controlling access for greater peace of mind. When aging in place, keyless locks should be considered a big priority for those with limited mobility or pains like arthritis as well as those who might live alone and need heightened security.